Dispensing Happiness: Blogging By Mail#3: Thanks, UPS Man! I've been peeking out the front windows all Monday. I just had this feeling I'd get a package. My Blogging By Mail package arrived, from Chronicler...all the way from our former home (albeit the southern part), California! 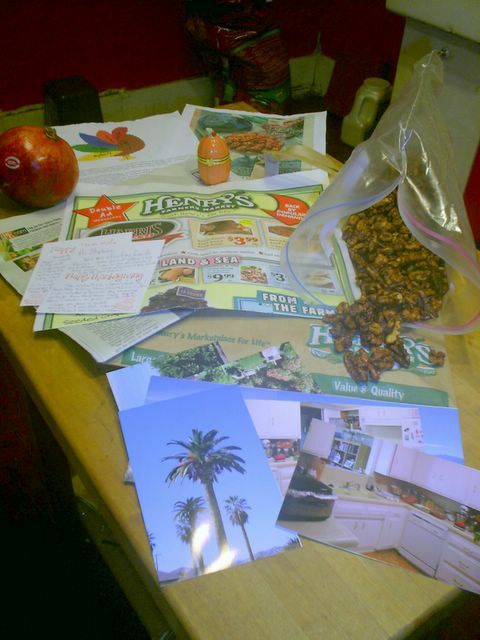 And what a neat package, too...Chronicler sent photos of her kitchen (hey, it doesn't look that small!) and the surrounding areas; boy, do I miss those palm trees. A flier for her sort-of good for you store, the local food section, a recipe for pumpkin pie, a sweet note detailing what Thanksgiving means to her, the cutest little hinged pumpkin box, a pomegranate (after last weekend's Blog Party round-up, I'll be running through lots of them! ), and both the recipe for and the finished product for Chinese Fried Walnuts. Matt tasted one, and declared "we're making these". It was all so thoughtful, and I do love getting mail! Thank you so much, Chronicler, we loved everything. Especially the part where you brought a little bit of California back into our lives. Stephanie, I am so glad you enjoyed my little package. I really stressed about what to send, did I send enough, did I send the right stuff, etc etc etc. I knew the walnuts would be enjoyed, because everyone seems to love them. And I am glad I could take you back to California, even if it was just through pictures! Chronicler; everything was wonderful, really! I do the same thing, though...I always worry I'm not sending enough. Plus, 2 out of the 3 times, I've had to ship overseas. That seriously limits what I can send: baked goods do not handle international travel well! And yes...it was nice to see those CA skies again....Thanks!